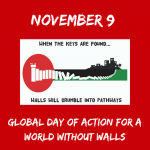 November 9 has been launched as a Global Day of Action for a #WorldwithoutWalls by Palestinian and Mexican movements because we recognised each other in the shared injustice we are suffering and in our ongoing struggle to achieve justice, equality and dignity. This connection was only the start: the idea of #WorldwithoutWalls has inspired and brought together many more movements. Over the last months over 370 organisations from some 30 countries around the world have joined in the call. In these days all, as over the world actions on the ground and interactions online for a World without Walls are taking place, Palestinian ongoing popular Friday protests against Israel’s apartheid Wall will be only one of many actions calling with urgency for a World without Walls. Israel has built this illegal wall and the settlement infrastructure to dispossess us from our lands and encage us in our communities on not more than 13% of our land. This recreates the Bantustans of the erstwhile South African apartheid regime. Today popular resistance against Israel’s wall has become a symbolic struggle within the Palestinian national movement to achieve liberation from Israeli military occupation, siege and repression, equality for all as citizens and the return of our refugees. The last months of mobilising have brought the activists of the Palestinian Stop the Wall Campaign closer to many different struggles across the globe and it is more evident than ever before that Israeli apartheid, colonialism and occupation are a central part of a global system that at its heart dehumanises the majority of us in order to oppress, exploit, expel or kill us. The Israeli regime is unique in many ways. It is a state that not only practices de facto apartheid but has enshrined this in its laws; the longest standing military occupation in the world; a regime built to perpetuate the practices of settler colonialism, against which people in other places around the world have fought for hundreds of years, in a geographically crucial spot, Palestine, the crossroad between East and West, at a time when elsewhere decolonisation was finally unsettling the ruling powers and forced them to change patterns of dominance. Yet, Israel has a concrete impact on the lives of people all across the globe. Israel has become a global laboratory for today’s and future ideology and mechanisms of racial segregation, repression and control, exclusion and dispossession. Who would have thought in 2002 when Israel started building its apartheid Wall that today we would have nearly 70 walls around the world built to militarise borders or to annex occupied lands? Who would have thought it possible that exactly one year ago Donald Trump won the presidential elections by promising a Wall? Walls are key elements in today’s racist policies aimed against migrants, including refugees, to criminalise and keep them out or kill them. Walls are ever more pervasive in cities and societies to segregate, control and repress. Ideologies of hatred and supremacy are growing together with these walls and the profits of an entire industry of walls, fear and exclusion are rising exponentially. By 2022, the border security market is expected to rise to $52.95 billion globally. Behind those walls, corporations and governments are feeding one off the other, financing each other and maintaining an architecture of corporate and state impunity. It is high time we hold them accountable! As Palestinians our interconnection with the people struggling in their own countries for justice, freedom and equality calls therefore for a concrete common effort to stop the ideological, military and commercial ties that finance and legitimate Israeli apartheid and help it to export what it has tested on our people to the rest of the world. Boycott, Divestment and Sanctions is our Palestinian call to stop impunity and undercut the financial sustainability of Israeli apartheid and the world of walls it promotes. Today we know, that we, the people of the world, have a common struggle and common hopes and dreams that one day we will all live in a #WorldwithoutWalls. As Stop the Wall is joining the International Caravan for People’s Sovereignty and against the Walls of Infamy, which after a long journey through Mexico is about to reach the US border Wall, we know one thing for sure: We have only just begun the march.